LET US MANAGE YOUR INTEGRATIONS. This program is intended for customers who want to have a fully managed integration set up by Acuity for its integrations. We help you define the integrations, then we develop, deploy and monitor them for you ongoing. 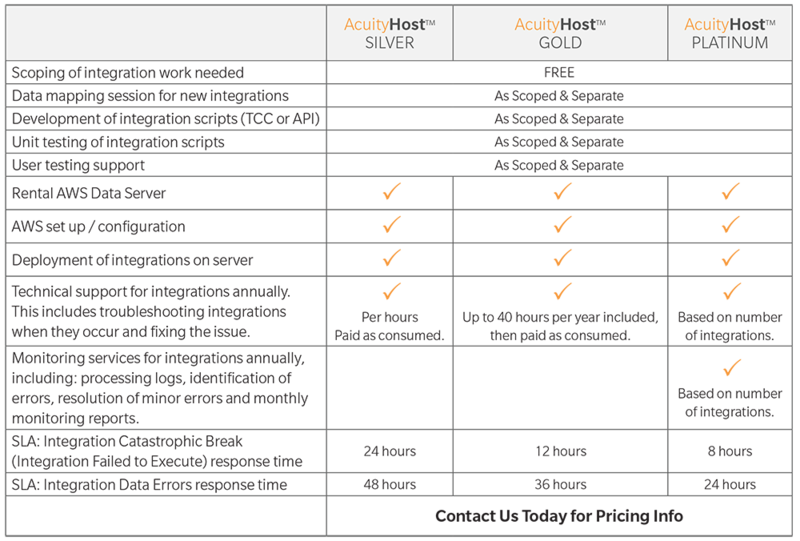 Three tiers of the AcuityHostTM program for you to choose from, depending on the level of support you need. A data warehouse is the foundation for a successful Business Intelligence (BI) program. The concept of data warehousing is to create a permanent, secure and central storage location for the various data sources needed to support the company’s analysis, reporting and other BI functions. Acuity supports exporting and consuming to data warehouses saving our clients time, money and human resources. Monthly database administration and initial setup: Server set up, Database set up, Customer provides data files, Data load (server). Any integration extraction services would be quoted separately on an as-needed basis. Unlimited reporting user licenses and Initial setup: Connect to database, Set up dashboard, Issue user licenses. Delivering data exports via spreadsheet, reports and dashboards for customers who want easy access to data. We help companies easily access and analyze workforce data to make more informed decisions. We offer a variety of report writing packages which can include report optimization, re-creation, knowledge transfer, ad hoc Q&A support and testing. English and French-speaking services are available. Remote Service Administration (RSA) package clients have the option to receive standard reports on a monthly basis which summarize company ticket trends and performance. Our reporting service can be very powerful to help optimize your system configurations and business processes to gain and maximize efficiencies. Never wonder if you’re getting value out of services. Analyze and share these reports with your C-suite to validate budgets and/or gain new resources to optimize your systems to their maximum potential. We’ve developed a custom add-on for your Taleo Connect Client instance that allows you to make API web service calls to or from OTAC Taleo Enterprise. EASILY SELL ONLINE & EVERYWHERE ELSE. We implement, optimize and maintain fully-hosted cloud-based eCommerce solutions. Easily brand and position your website to look great and meet customer needs with an easy and secure checkout process, and maintain inventory, ship and track sales and growth trends from a unified platform. There’s also a variety of marketing and integration opportunities based on what your business needs. Flexible and creative designs that look great on any device. Accept credit card and other payments securely. Automate tracking and notifications for inventory. Built-in services from major carriers with discounts, printing labels and more. Easily collect data for communication and future marketing efforts. Easily integrate solutions for social marketing and sales.